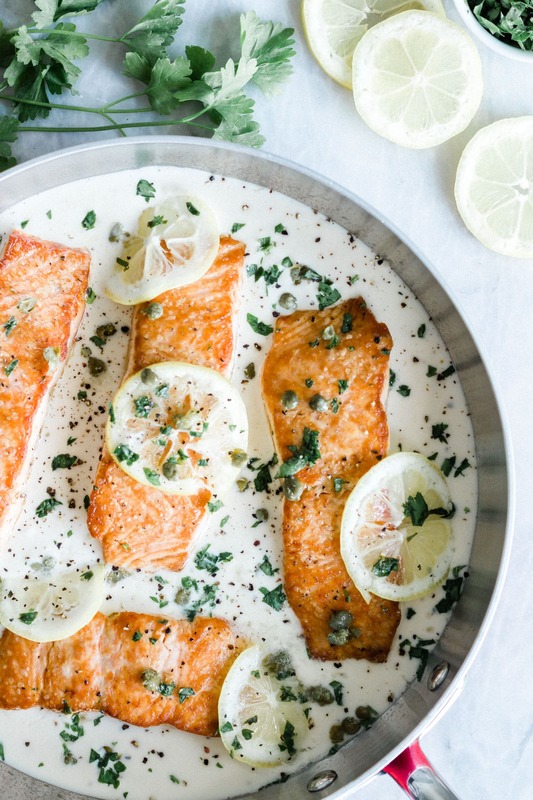 Don’t miss this quick and easy Salmon Piccata Recipe with all of the authentic Italian flavors of lemon, garlic and capers. It’s really no secret that I’m about as Italian as it gets! I pretty much always talk with my hands, have some serious volume control issues, and love to give giant bear hugs. ;) Those are definitely some side effects of being raised in an Italian family- LOL! Growing up Italian came with a lot of perks though. Not only did I learn the proper way to give those bear hugs ;), but I learned how to host huge family gatherings and of course cook some delicious Italian dishes! 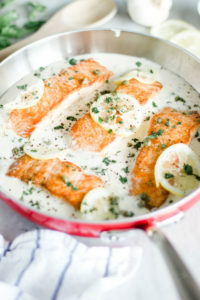 One of our famous family recipes is for a homemade Salmon Piccata. I can vividly remember my mom making this recipe for dinner as a kid. Now as a mom myself, I can totally understand why it was one of her favorite recipes to make. 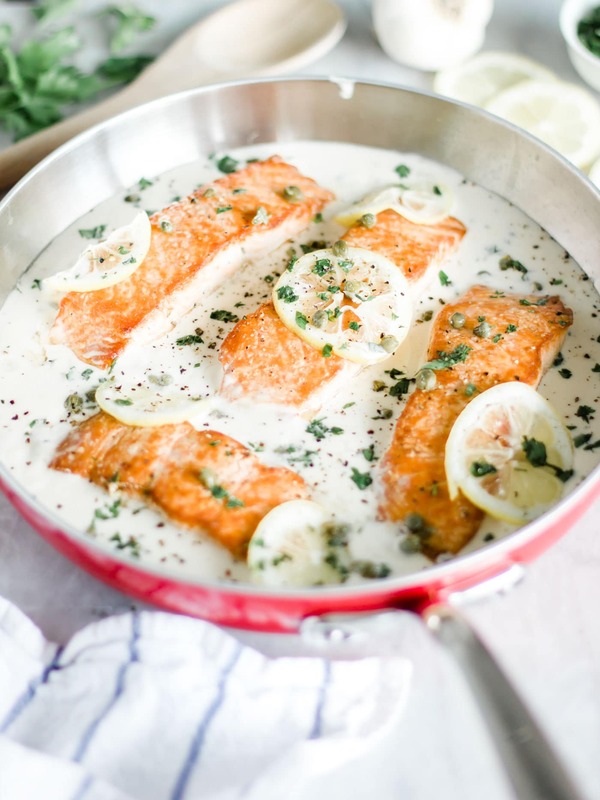 This Salmon Piccata is such a classy recipe that is super easy to make! It’s packed full of amazing flavors and can be prepped, cooked, and served in under 30 minutes! Piccata recipes are some of my absolute favorite recipes to make! From the traditional Veal Piccata to the super popular Chicken Piccata, piccata recipes are guaranteed to be huge hits for family dinners! These days, there are so many variations and twists on piccata recipes, but for a recipe to earn that piccata title, there are a few requirements! ;) In Italian cooking, piccata basically refers to how your meat is prepared and the type of sauce it’s prepared in. The meat you’re using should be cut fairly thin, so you can easily saute it and quickly sear it. 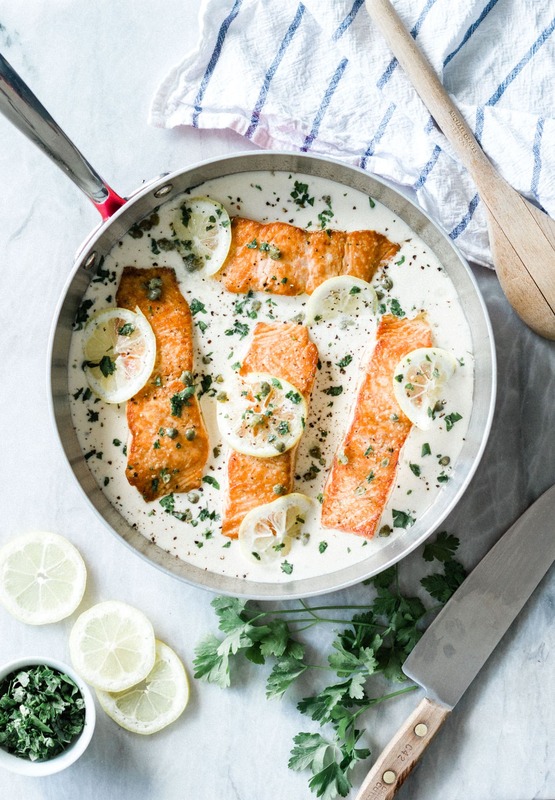 Then you’ll need a buttery, lemony sauce to top off your piccata recipe. The great thing about any piccata recipe is how quickly you can throw it together! No matter what variation you choose, a classic piccata recipe is fantastically fool-proof and incredibly delicious! My easy recipe for salmon piccata, starts with a pinch of salt! I always, always season my salmon fillets in sea salt and let them rest before cooking. I prefer sea salt, but you can also opt for other, coarse salts like Kosher salt, if that’s what you have on hand. 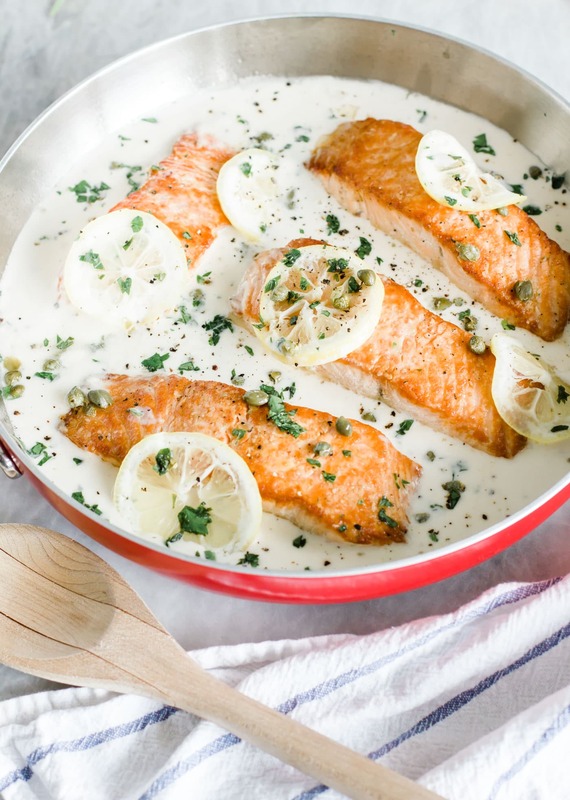 While your salmon fillets are absorbing the salt, heat up a tablespoon of grapeseed oil in a large skillet. If you haven’t ever used grapeseed oil, this is a great recipe for you to get familiar with it! I am actually a huge fan of grapeseed oil! It’s got a light flavor and texture, so it easily incorporates into all kinds of dishes. Plus it has a super high smoking point! The smoking point is just the temperature where an oil starts giving off a pesky smoke, so it’s definitely something to keep in mind! Grapeseed oil’s smoking point is a lot higher than olive oil’s, so I’ve found myself using it more and more. It’s nice for recipes that require a lot of searing or sauteing, so I’m not smoking up the whole house while cooking! ;) Once your skillet is super hot and coated with oil, you can add in your fillets and let them cook! Depending on the size and thickness of your fillets, they should only take about 4 minutes on each side before they’re ready! Season both sides of salmon fillets with salt. Add grapeseed oil to skillet and let the pan get piping hot. Add salmon and cook 4 minutes on each side. Remove from pan. Add remaining 1 tablespoon butter to pan and melt. Add garlic to the melted butter and sauté for a minute. Add wine and bring the mixture to a boil, scraping any browned bits off of the bottom of the pan. Cook until liquid almost evaporates. Add 3/4 cup broth to the pan along with the lemon juice and cook for a few minutes. Mix the cornstarch with the reserved 1/4 cup stock/broth, and mix to combine evenly. Pour the mixture into the pan, stirring to create a sauce for a few minutes. Add capers and place salmon fillets back into the pan.